Looking for a sweet and tasty treat to nibble on? This soft homemade caramel corn is just the snack- soft, chewy and full of the caramel flavor you love. 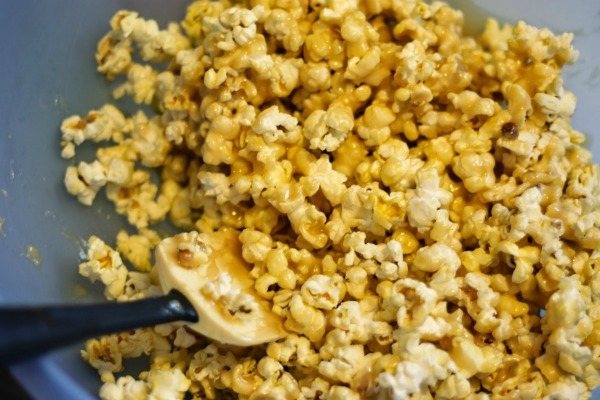 It is also easier to make than you might think and the caramel can be poured over stove or air popped as well as microwave popcorn (although I am a die hard stove popper so I recommend that). However, This air popper is awesome too for quick popping and easy clean up afterwards. 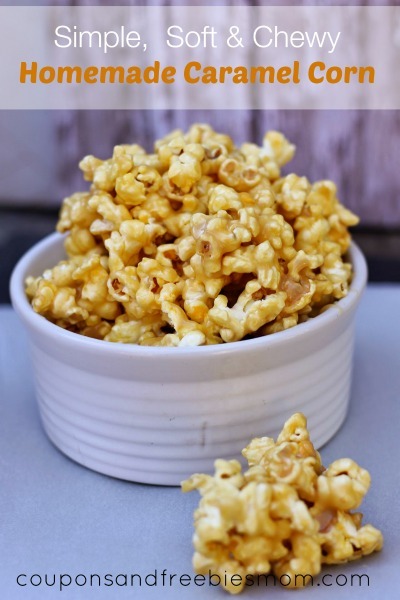 This Soft Homemade Caramel Corn is ideal for a homemade Christmas gift! Yummy and delicious! Be sure to make it right before you leave so it will arrive fresh, delicious, and ready to eat! If you love this recipe, be sure to check out our 12 Days of Handmade Christmas Gifts series, where you’ll find great inexpensive DIY Homemade Gifts! 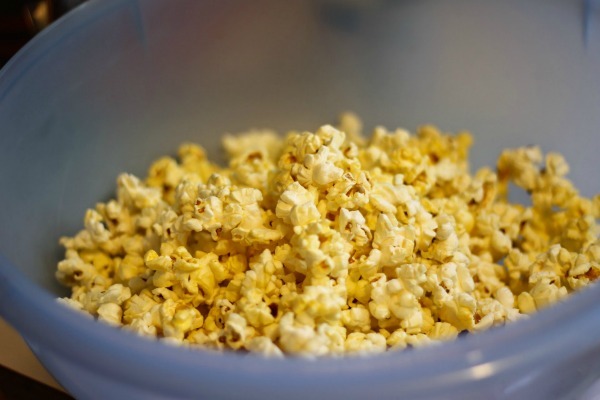 Remove all kernels from popped corn and set it aside. 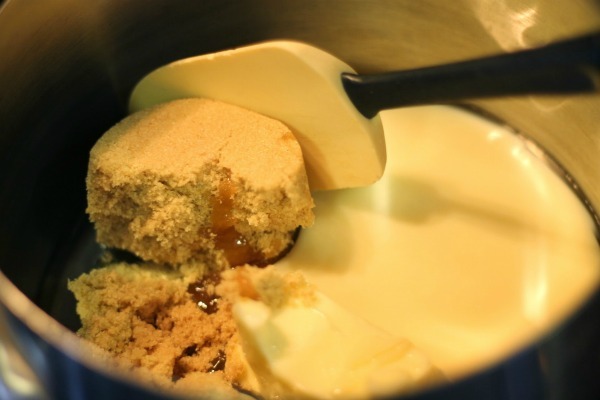 Place butter, brown sugar, and corn syrup in a large saucepan over medium-high heat until melted, bring to a boil. Reduce heat to medium, stir in condensed milk. Continue boiling for 5 minutes, stirring constantly. Remove from heat and stir in vanilla, quickly pour over popcorn. If you love this gift idea, be sure to check out our 12 Days of Handmade Christmas Gifts series, where you’ll find other great inexpensive DIY Homemade Gifts! I love to make caramel popcorn balls to hang on our Xmas tree but they never taste fresh for long. Thanks for the tip to wait to mix it together just before you eat it. My mom used to make this when i was little. I loved it! I have to make this now. This looks so delicious and yet so easy! A great recipe to try with my kiddos. May have to double the recipe because I am sure it won’t last long. This made my mouth water. I’ve always wanted to know how to make toffee popcorn or caramel popcorm – yum. Oh wow this looks amazing!! and so easy to make! This looks so good. I will have to make it as party food for my next party. It’s great to present someone box with some movies and lots of popcorn around the DVDs. But am not sure I could do it with caramel corn 😀 Anyway…I definitely am gonna use this recipe for myself and family. To be honest I have thought about trying to make this before, just wasn’t sure how to go about it! thanks! 2love caramel popcorn. Thank you for the recipe.